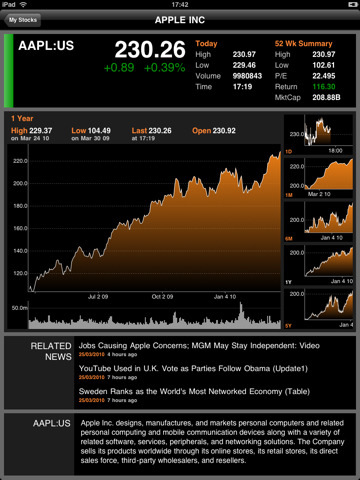 Bring the power of the most trusted source for financial information to your iPad, along with tools to help you analyze the world’s markets. More than 280,000 professionals around the world trust Bloomberg to give accurate, timely information about the world’s financial markets. That source is now available to you on your iPad. Bloomberg offers news, stock quotes, company descriptions, market leaders/laggers, price charts, market trends analysis, and more. Please send any comments or suggestions by touching the Bloomberg logo in the summary screen and using the ‘Questions or Feedback’ button. You can also reach us at: feedback@bloomberg.com. The information for these tools comes from the BLOOMBERG PROFESSIONAL® service, through the BLOOMBERG.COM® website.